Crack into a snack time favorite with these hand-roasted and salted pistachios. Crack into a snack time favorite with these hand-roasted and salted pistachios. The deep roasting process produces a superior nut with a signature flavor and crisp texture--the way pistachios were meant to be. California pistachios hand-roasted in Brooklyn, New York. 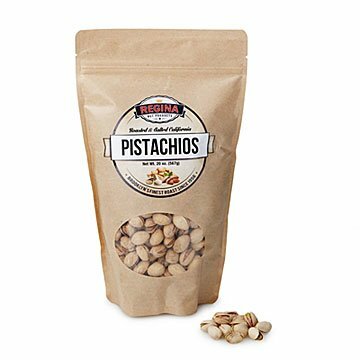 Pair your Roasted and Salted Pistachios with our Pistachio Pedestal. These are the best pistachios I've ever eaten! I'll be ordering them again! I think these were a hit. My brother texted me with heart emojis, which is always good. These pistacios are delicious as a snack. I purchased and had these pistachios sent to my Dad for his birthday - not only is he a lovable nut but a HUGE pistachio lover! Back in the day he would buy the red dyed ones and eat so many that he would sport tinted lips like he was wearing my grandmothers (his mom) deep red lipstick. Needless to say Dad loved his gift which included the pistachio serving tray set - he told me they were the best tasting freshest pistachios! Will likely buy them again for him! Nuts were very savory, despite being not roasted in oil. We can buy pistachios year round here, they are anywhere from average to good. But , my family really loved these and I would definitely buy them again. Not like the mundane ones at the grocery store. Really nice flavor, fresh!! They were a perfect gift, paired with the Pistachio Pedestal. My friend eats pistachios daily and says these are the best he has ever eaten. Perfect Gift with the holder! A perfect gift for the guy that is hard to buy for!